“It’s been a real challenge for me to be able to ski well despite this injury." The first phase is called theacute inflammatory phase. This phase will last approximately 72 hours. After the initial injury, an electrical current is generated at the wound, called the “current of injury.” This “current of injury” attracts fibroblasts to the wound (Oschman, 2000). During this phase there is also initial bleeding and continual associated inflammation of the injured tissues. Because of the increasing inflammatory cascade during this period of time, it is not uncommon for the patient to feel worse for each of the first three days following injury. Because there is disruption of local vascular supplies, there is insufficient availability of substrate (glucose, oxygen, etc.) to produce large enough quantities of ATP energy to initiate collagen protein synthesis to repair the wound. After about 72 hours following injury, the damaged blood vessels have repaired. The resulting increased availability of glucose and oxygen elevates local ATP levels and collagen repair begins by the fibroblasts that accumulated during the acute inflammatory phase. This second phase of healing is called thephase of regeneration. During the regeneration phase the disruption in the injured muscles and ligaments is bridged. This phase will last approximately 6-8 weeks (Jackson, 1977). At the end of 6-8 weeks, the gap in the torn tissues is more than 90% bridged. There is a third and final phase of healing. This phase is called thephase of remodeling. Thephase of remodelingstarts near the end of the phase of regeneration. During the phase of remodeling the collagen protein glues that have been laid down for repair are remodeled in the direction of stress and strain. 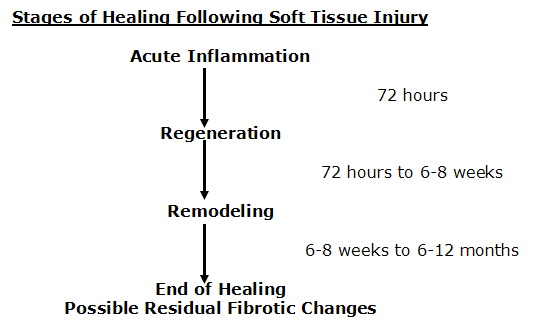 This means that the fibers in the tissue will become stronger, and will change their orientation from an irregular pattern to a more regular pattern, a pattern more like the original undamaged tissues. Is there a safe, effective approach to enhance the timingand quality of musculoskeletal healing that targets the second phase of the response, thephase of regeneration? Key to this discussion, and it is important to restate, is that ATP energy is required to synthesize repair proteins. In 1997, Douglas Wallace wrote an article for Scientific American titled “Mitochondrial DNA In Aging and Disease.” In this article, he notes that an intracellular organelle, the mitochondria, is the power plant of cells because it produces ATP energy. “Mitochondria provide about 90% of the energy that cells, and thus tissues, organs and thebody as a whole, need to function.” Every cell in the body contains hundreds of mitochondria that produce the energy that the body requires. Synthesizing repair proteins occurs primarily in thephase of regeneration. Attachment of a single amino acid onto the string of amino acids that will become a protein requires the availability and expenditure of 4 ATP molecules (Champe 1994). Also, additional ATP molecules are required for both initiation and termination of the amino acid chain synthesis.The development of repair proteins is limited by the availability of ATP energy. Thecytochrome c oxidaseenzyme is a terminal enzyme of the mitochondrial electron transport chain. In fact, it is the rate-limiting enzyme in the production of ATP energy by the electron transport system. 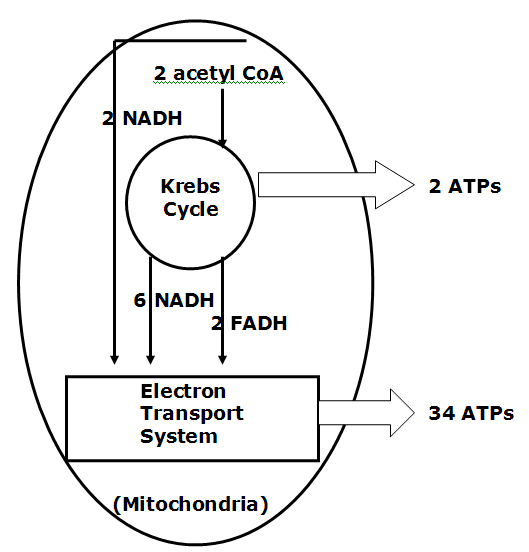 Upregulating or increasing the activity of thecytochrome c oxidasewill proportionally increase the genesis of ATP energy. How can the treating doctor upregulate or increase the activity of thecytochrome c oxidaseenzyme? A portion of the answer is the understanding that“chrome”pertains to color. The remainder of the answer isLow Level Laser Therapy. Laser light is different than background environmental light. 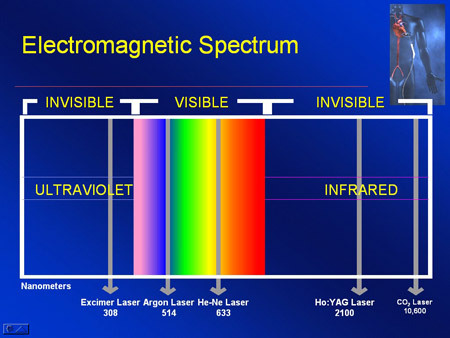 In the electromagnetic spectrum, visible background environmental light exists between wavelengths of about 400 – 800 nanometers (nm). Different wavelengths will produce different colors. As examples, 410 nm is a blue color, 535 nm is a green color, and 635 nm is a red color. Background environmental light is a combination of all wavelengths, and therefore of all colors. Laser light ismonochromatic. This means laser light is of a single wavelength and therefore a single color. Laser eliminates all wavelengths but one. Background environmental light is also scattered, meaning the light is spread in all directions. In contrast, laser light iscoherent. This means that the light is not scattered. All of the light waves are brought to a single point. “It is well known that it is only in the ideal case where the supply of electrons from cytochromecoxidase is unlimited that electrons are always present to reduce oxygen,” thus maximizing production of ATP and minimizing production of oxygen free radicals. In summary, and consistent with the explanations above, these researchers credited the outcomes of this animal study to laser driven excitation of thecytochromeenzyme terminal electron carriers of the mitochondrial respiratory chain, increasing ATP synthesis and enhancing repair protein production. In summary, the evidence suggests that low level laser therapy targets the mitochondrial enzyme that is the rate-limiting factor in the production of ATP energy, thecytochrome c oxidaseenzyme. The increased production of ATP energy allows the DNA to enhance the replication of repair proteins, accelerating healing and improving symptoms. 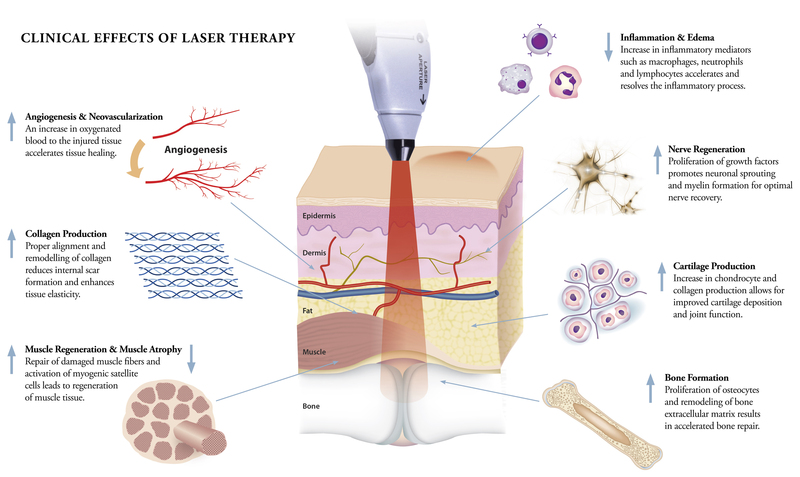 Since lasers can achieve this without side effects or risks, low-level laser therapy is here to stay. As a consequence, many chiropractors now incorporate low level laser therapy as a component of their patient clinical management, especially of injured patients. 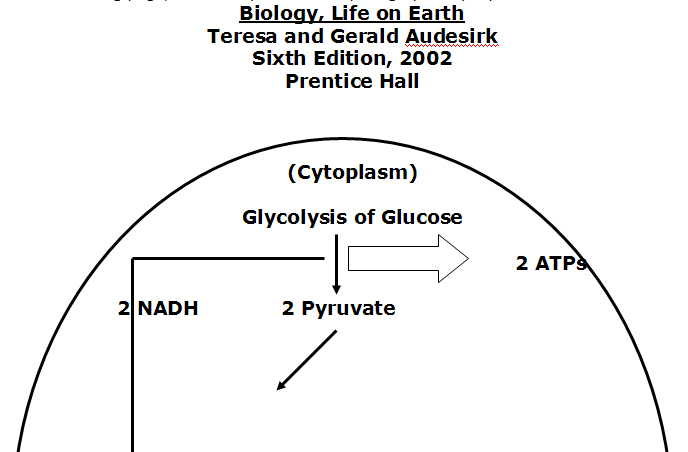 Audesirk T, Audesirk G.Biology, Life on EarthSixth Edition, Prentice Hall 2002. Champe PC, Havey RA.Lippincott’s Illustrated Reviews: Biochemistry, Second Edition, Lippincoll Eilliams & Wilkins, 1994. Jackson, R.The Cervical Syndrome, Fourth Edition, Thomas, 1977.